Oh Baby - A Finish . 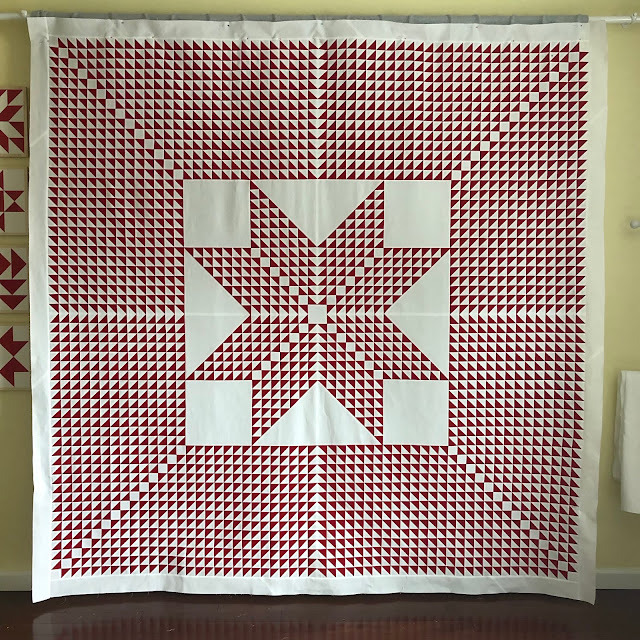 . . . .
After steadily working for over 6 weeks on my red and white adventure I was ready for something speedy, and what's quicker to piece than a baby quilt? 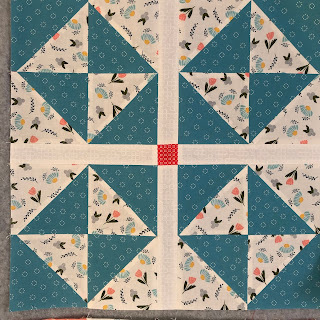 The mama to be requested a quilt of navy, turquoise, pink, and coral. Using an assortment of Bonnie & Camille, Fig Tree, and Sherri & Chelsea fabric I was able to pull together what I think is a pleasing palette for a sweet baby girl. The navy on white background fabric is Blossom by Christopher Thompson for Riley Blake. 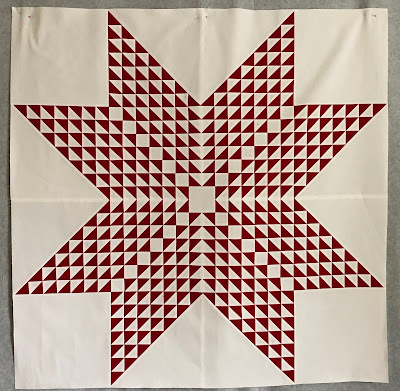 There are several colors in this line, I'm using the red on white for the backing on my red and white quilt. I'm fussy when it comes to background fabric, I don't like directional prints or any print that looks messy when it's cut apart and then sewn back together. 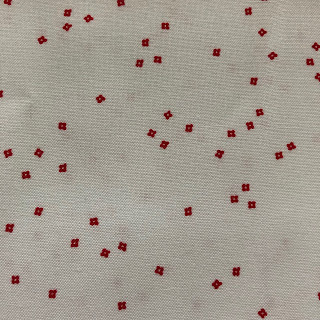 The random design of this print checks all my boxes. The fabric is an assortment of Moda by Bonnie & Camille, Fig Tree, and Sherri & Chelsea. It finished at 42" x 46" and has approximately 99 pieces. Oh Baby! 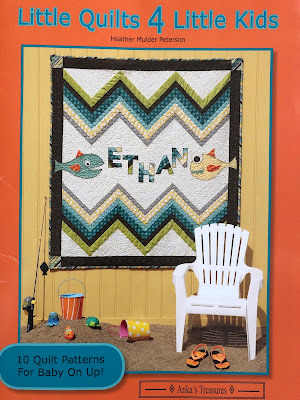 has a couple of fabric choices, I went with the scrappier version, and I agree with Heather, it's great for a boy or girl. 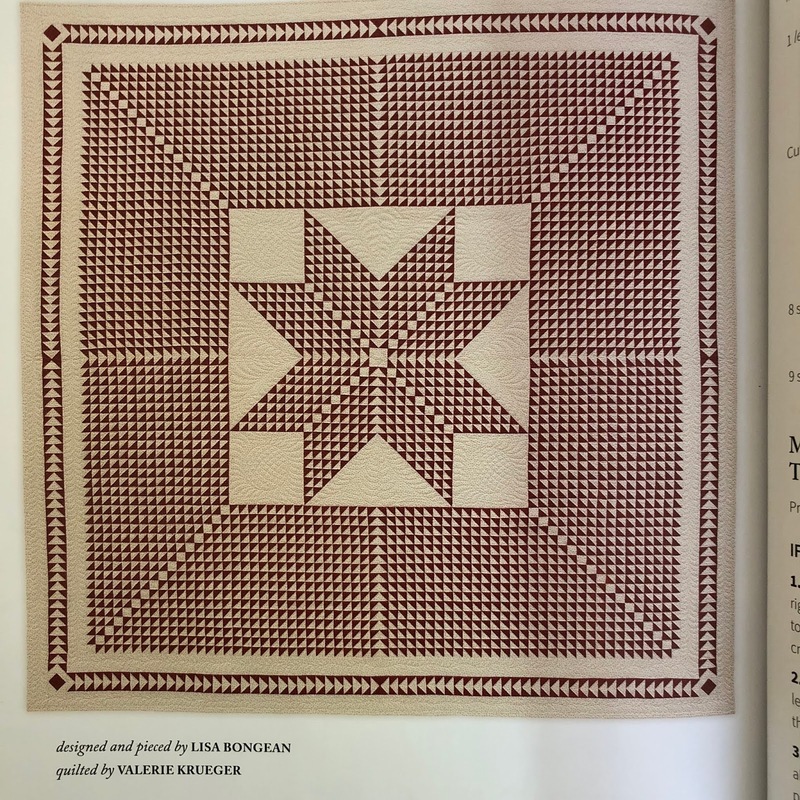 There are 10 patterns in this book, all of them cute. The book is available here. I'm still not ready to commit to another large or time consuming project, another quick and easy is coming up next. Memories of a Masterpiece - A Finish . . . . . 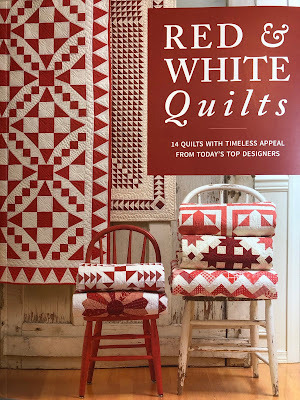 If you're a regular follower of my blog you know my most favorite quilts are red and white quilts. 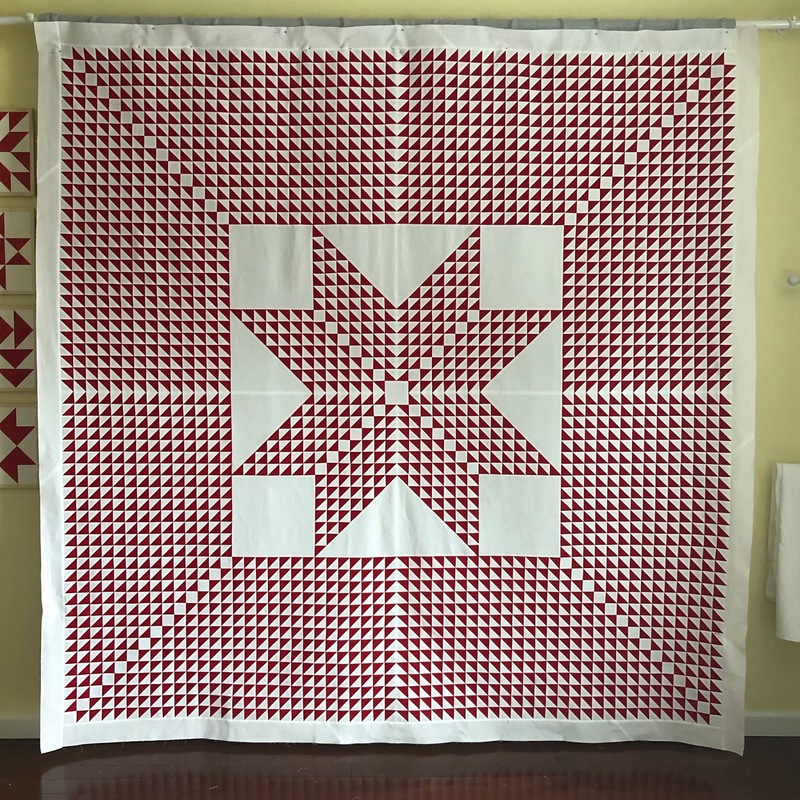 I usually make one red and white quilt each year. 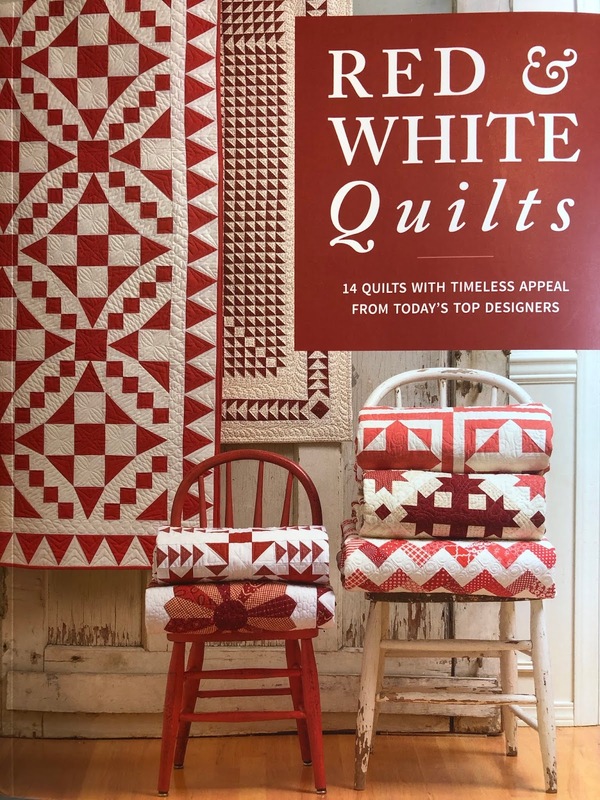 When this Red & White Quilts book was announced by Martingale I immediately preordered my copy, and that was based on the cover quilts alone. 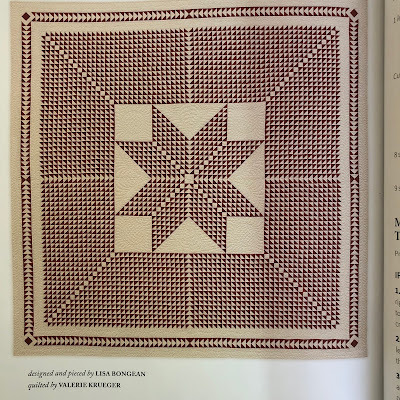 When I received my book and was able to see all the patterns I was not disappointed and knew this would be a book I would use for several upcoming projects. But one quilt stood out above all the others, Memories of a Masterpiece by Lisa Bongean. I knew I would make this quilt first. Lisa's quilt finished at 76" x 76" and is made up of 3,272 one inch finished half square triangle units. Lisa used a tone on tone red print and a cream background fabric with tiny red dots. 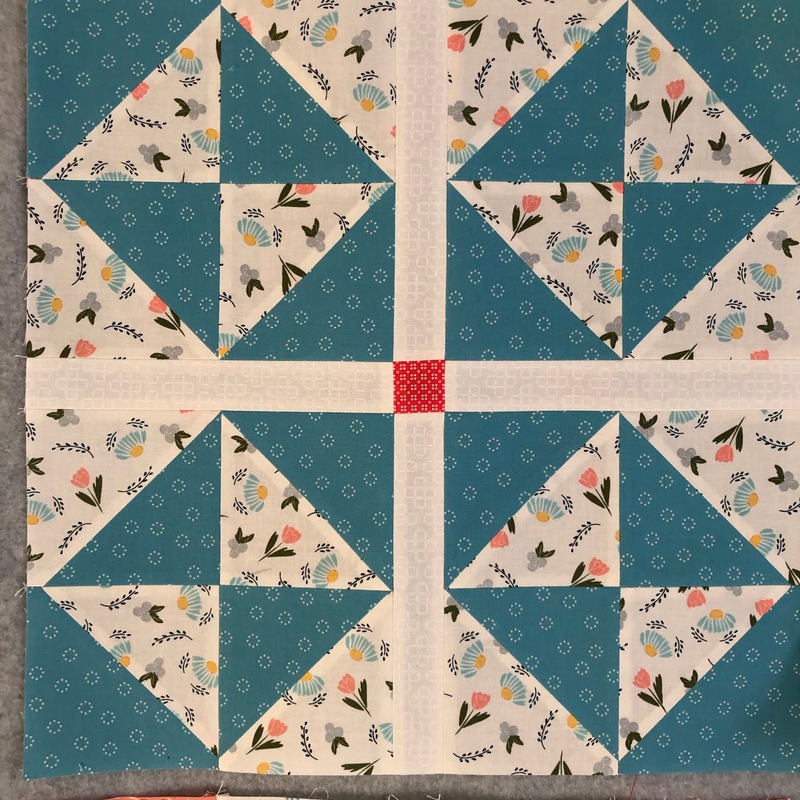 I love this quilt but the vintage vibe is not my style so I decided to change it up a little to maybe give it a more modern feel. First off, I used solids for my red and white fabrics. I went with my favorite red, Christmas Red by Moda. It's a nice bright red. 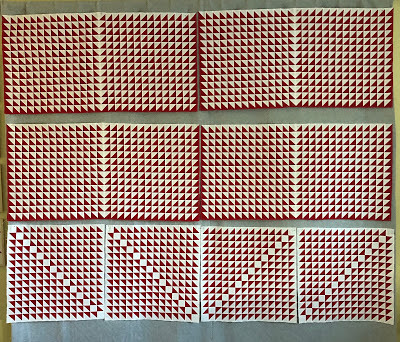 My next change was to increase the size of the hsts. Mine finish at 1 1/2", I went 1/2" bigger. And lastly, since my hsts were larger, I made my quilt top smaller, which meant I only needed 2,296 hsts. 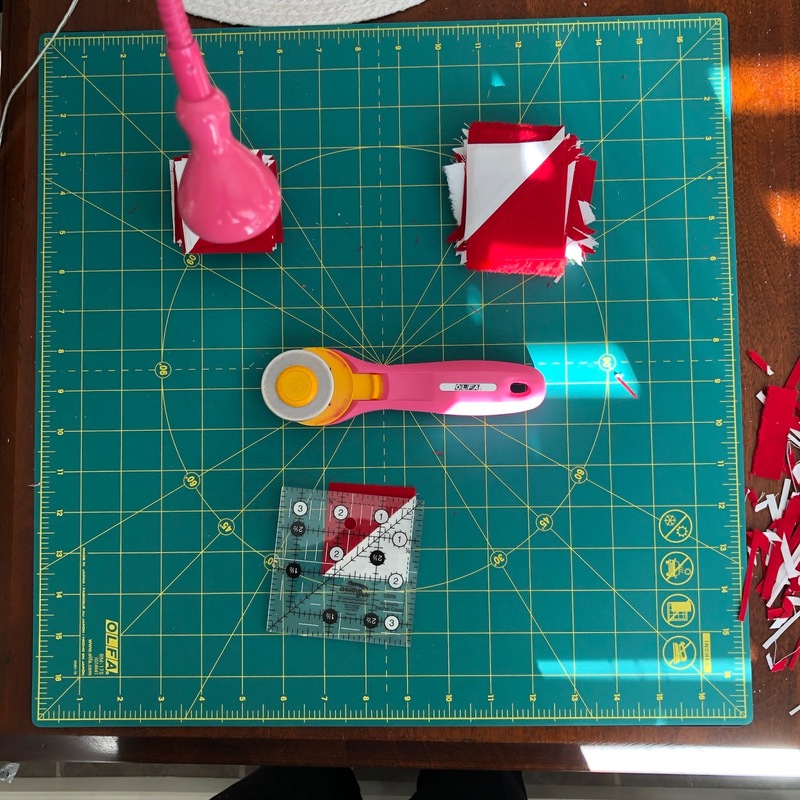 To make my hsts I used the Easy Angle ruler. I cut my triangle units 1/8" larger and squared them up after piecing. When I started this project I had the notion of just piecing my hsts until I couldn't stand to piece anymore, then take a break, making this a project to stretch out over the year. I started making my hsts the beginning of February during a very cold weather stretch when the only thing to do was stay in and sew. 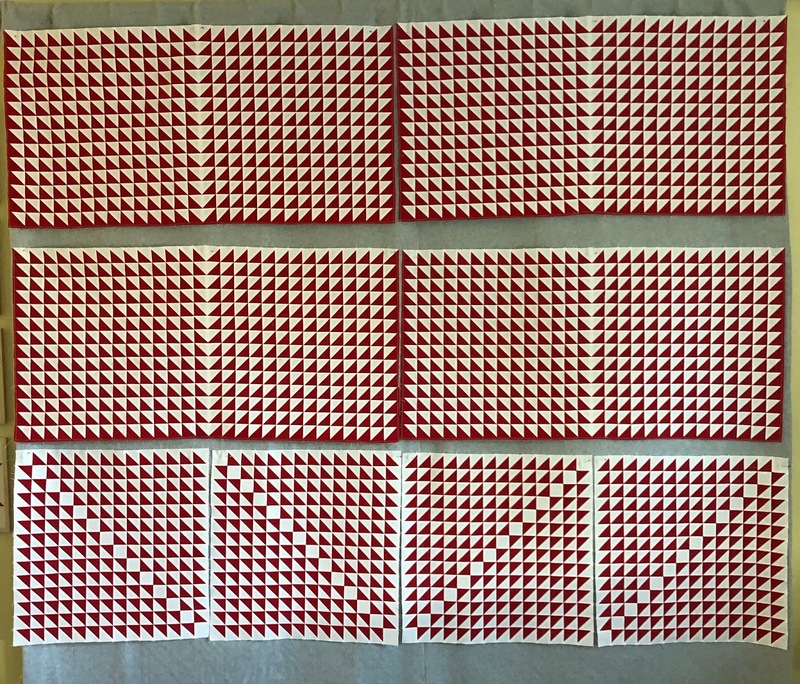 In 4 days I had 1,400 finished hsts. 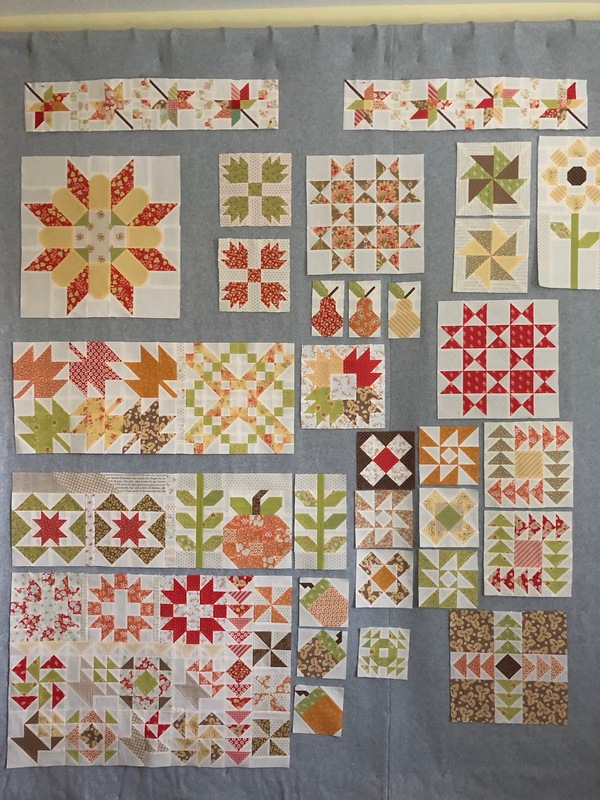 Once I had enough hst units to work with I started piecing the quilt top. I also trimmed 100 to 200 hsts daily. To make this process easier I set up a trimming station on the kitchen table, allowing me to trim units throughout the day and in the evening while watching TV. 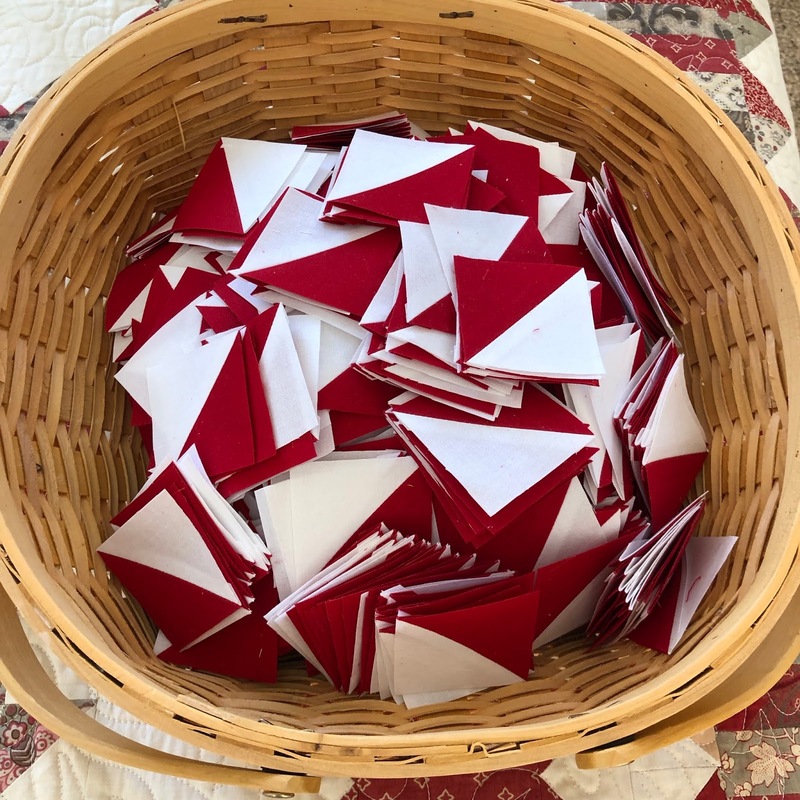 I think getting such a big jump on the volume of hsts the first few days, then cutting back to just a 100 or so a day kept me interested in continuing with the project and not stopping due to hst overload. The center was a breeze and a delight to piece. It felt so good to start taking hsts out of the basket while putting more in. I pressed all my seams open for this project. The outside border units came together, slowly. I just had to take my time and live with the fact that not all my points were going to be perfect. I did some resewing but not a lot. I found that my sewing machine was happier and the seams better aligned when I used a bigger stitch length. I usually drop my stitch length down a couple from the factory preset since I always press my seams open, so the thread doesn't show through. I just went with the regular length for this project. I pinned each seam on both sides of the seam. And in what really seemed like a relatively short period of time I was done, no break required. I found this to be a relaxing project, it was just simple pinning and sewing. And as I mentioned earlier, the weather was my best friend, there was nothing else to do but sew and listen to books. 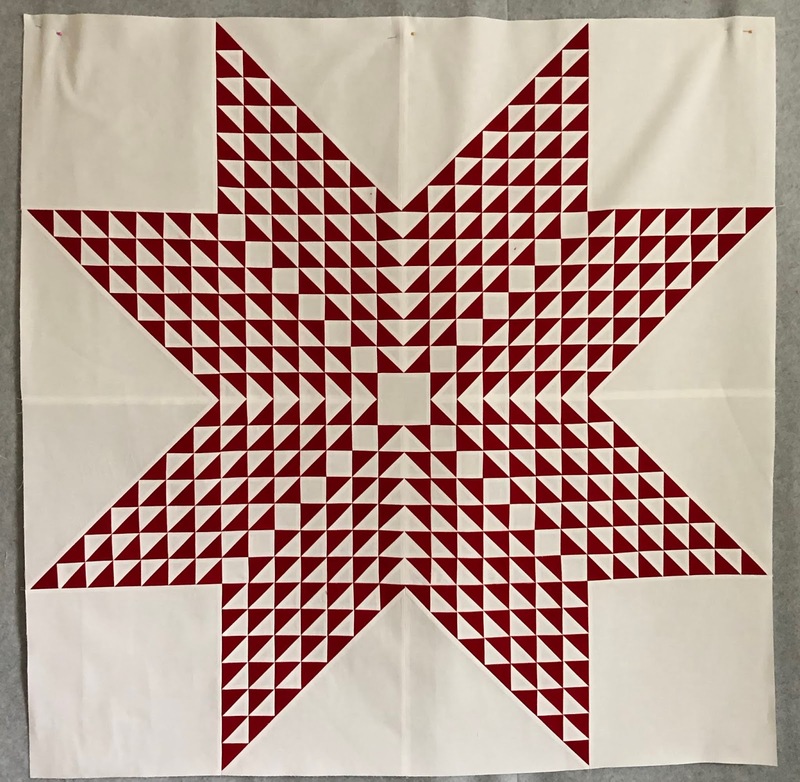 The pattern is Memories of a Masterpiece by Lisa Bongean from the Martingale Red & White Quilts book. 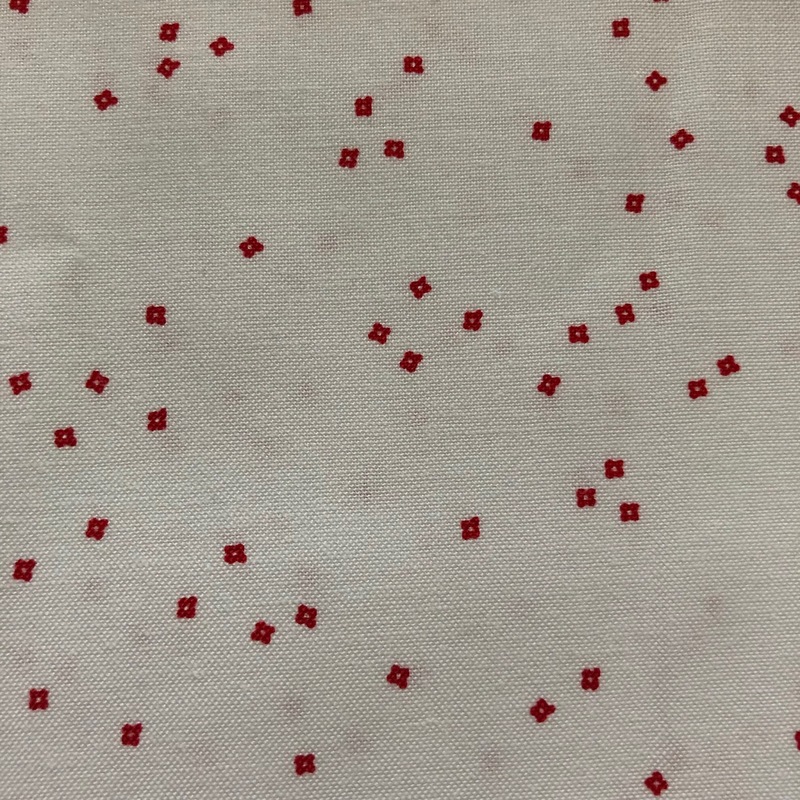 The fabric is Moda Bella Solid 9900-16 Christmas Red and 9900-98 White. I prewashed the fabric (the color catchers picked up no red during the wash), dried it in the dryer, then soaked it with starch and let it dry on racks. My quilt finished at 90" x 90", the pattern finishes at 76" x 76"
I did not add the outer row of geese, I was happy with the 90" size and loved the fresh look without them. There are approximately 5,141 pieces in this quilt top. My husband says this top makes him dizzy. My top may not have the wow factor of Lisa's quilt, but I think it makes its own statement, it packs more punch due to the bright red, is more me, and I could not be happier with it. it's Red on White Blossom by Christopher Thompson for Riley Blake. 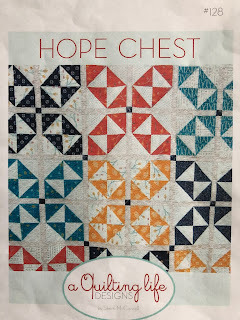 If you love this quilt pattern, but are intimidated by the volume of pieces or perceived work, don't be, it's not a hard pattern to piece, you just need start, and before you know it, you're done. Like my friend Vicky always reminds me, "How do you eat an elephant? One bite at a time." Just take that first bite. 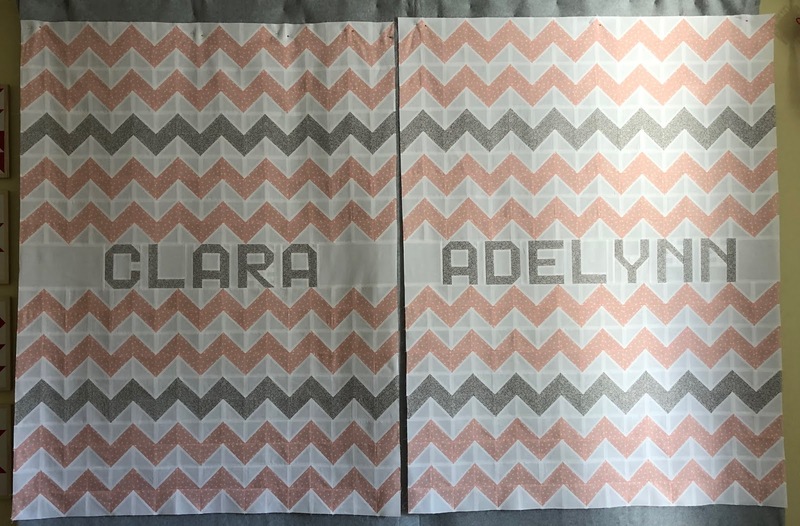 Next up, I need to make a baby quilt, I'm really looking forward to working on a smaller, faster project. That may be my theme for the next several projects. Here are the last two quilts I pieced for 2018. 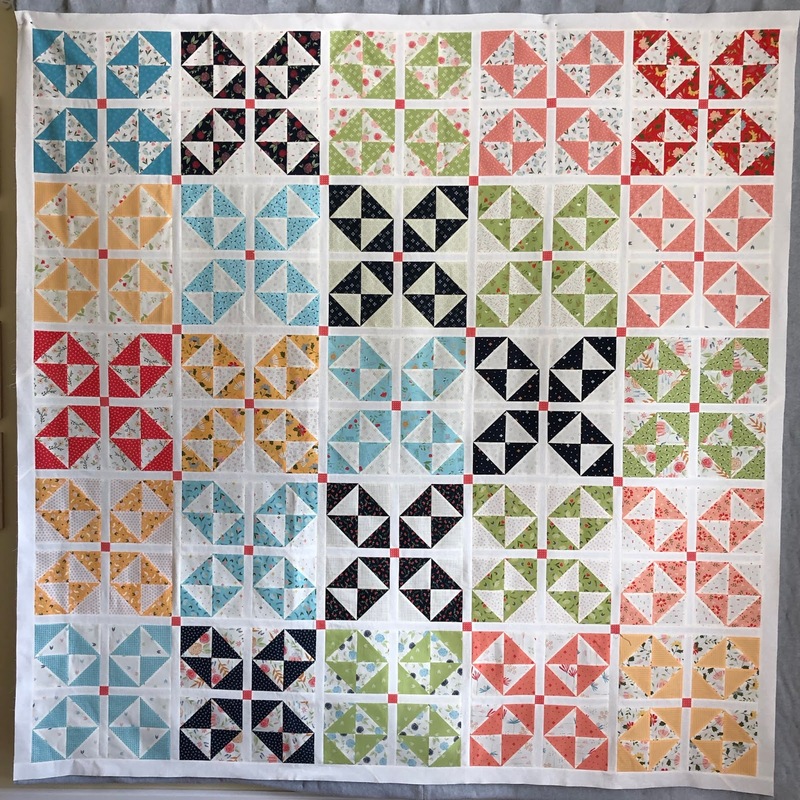 I was very excited when a friend told me she was going to be a grandma, "I'll make a quilt" was my first response. I always like the opportunity to make a baby quilt. A couple months later we all found out that one baby was going to be two. 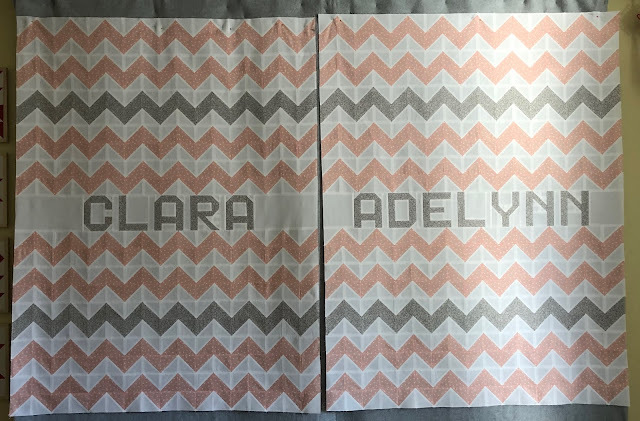 "Twins, now I get to make two baby quilts", was my happy response. 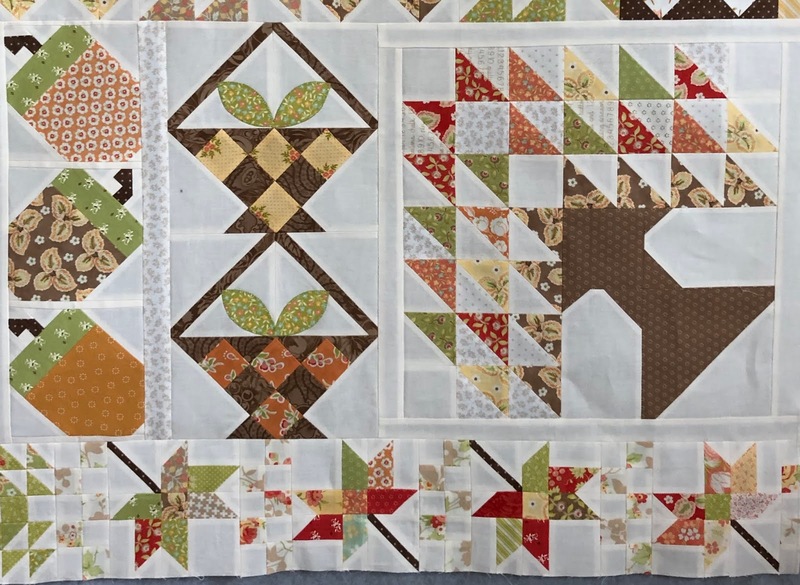 Since the mother to be did not want to know if the babies were boys, or girls, or one of each, I couldn't start on the quilts until they were born. Which worked out fine and meant I could make them more personal. The nursery was to be decorated using colors of soft pink, light grey, and white and the new mother didn't want anything overly fussy or girly. So I went with this soft pink polka dot. and this nice grey floral, girly but not overly so. The floral print did not have any detail on the selvage so I have no idea who the manufacturer or designer is. Each finished at 43" x 56"
The hsts finished at 2 1/2"
I went with white polkadot minkee for the backing. The quilts have been quilted, bound and delivered. Linda Hrcka at The Quilted Pineapple quilted them for me and is posting pics of the finished quilts on her blog today, go check them out, they look even better quilted. Thanks Linda for quilting these tops so beautifully and quickly. Also, thanks for all the sweet comments on my recent blogging activity. For some reason all I can accomplish on my blog is creating posts, I'm not able to respond to any comments, I'll keep working on the problem, but in the meantime know that I am happy to hear from you. 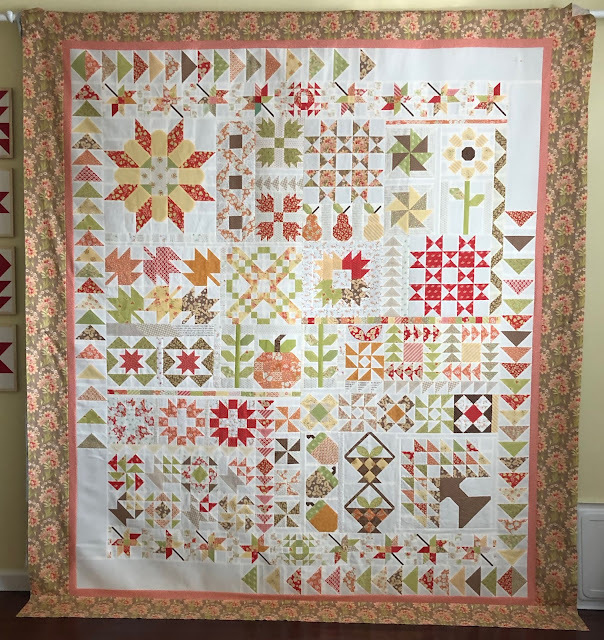 This is what's on my design wall now, it's a mystery BOM by Fig Tree Quilts called Autumn Splendor. This is my progress through the first 10 months. I have the patterns and fabric for the last two months prepped and ready to go. Up to this point I pieced this quilt in two blocks of time, months 1 through 6, then months 7 through 10. 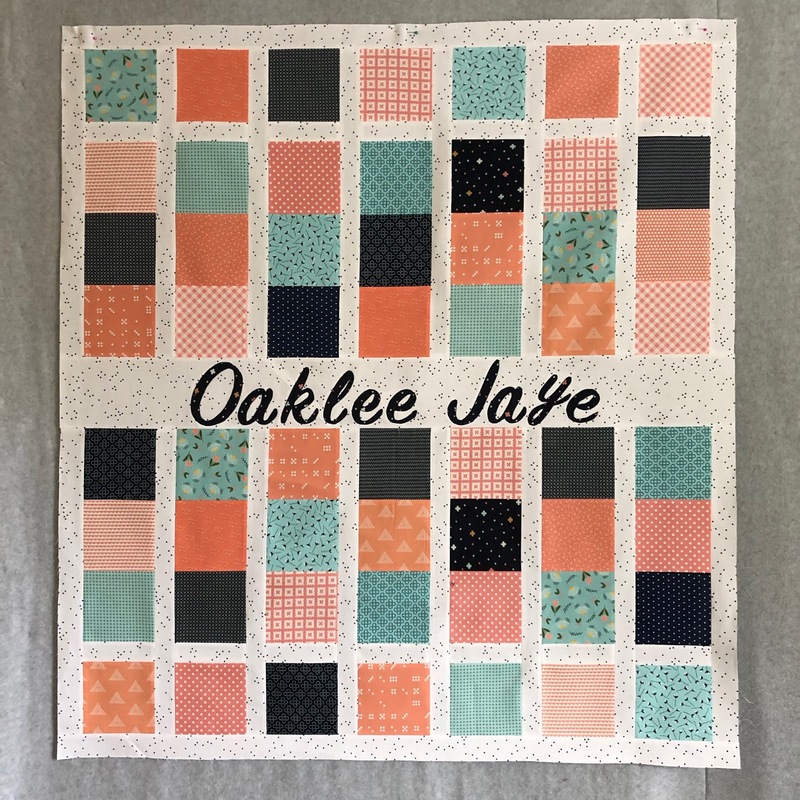 I'm not really a mystery project type of person, I don't like surprises, but I signed up for this one because the quilts from prior years have been very pretty and I was needing a project for the library raffle quilt. Quilts that were raffled in the past were Summerville, a Fat Quarter Shop BOM and a Christmas theme quilt, I thought a fall quilt would be something different and hopefully appealing. The goal is to make money, who's going to buy a raffle ticket for an ugly quilt?!? The plan is to wrap this up in the next week, this quilt needs to be pieced and sent off to a quilter as quickly as possible, the raffle starts in April. Now that Christmas is packed up and I'm not traveling for a couple of months I"ll have more time to spend in my sewing room. The weather is a big help too, first snow and now frigid temps are keeping me inside. No one was more surprised than me when I looked at the last date that I blogged, October 25th! I don't think I've ever skipped an entire month since I started blogging, let alone nearly 3! All is well at my house, just busy with the holidays, some traveling, and some company. Happy times. Thanks to all who checked on me, I should have posted a quick blog update that all was well and to check back in, I just kept thinking I would sit down and write up posts on my latest finishes. I do have some catching up to do but to just get things rolling I decided to blog about my first finishes for the year, I"ll go back and update the last of my 2018 finishes another day. The pattern is from the Christmas Figs Book and I used the Christmas Figs fabric too. 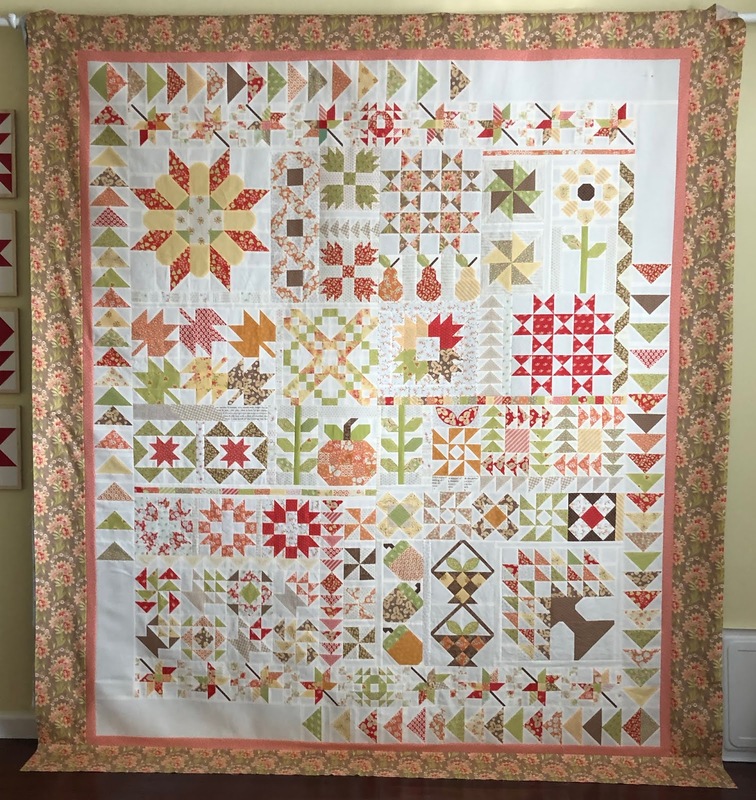 This quilt finished at 79" x 79" and has approximately 1,753 pieces. 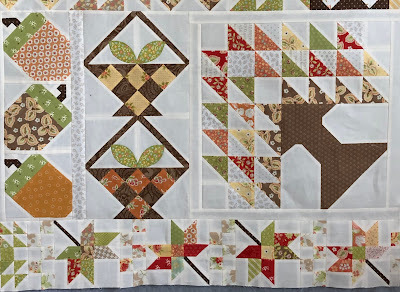 Those blocks finish at 16" and were fun to piece, the pattern instructions were wonderful. 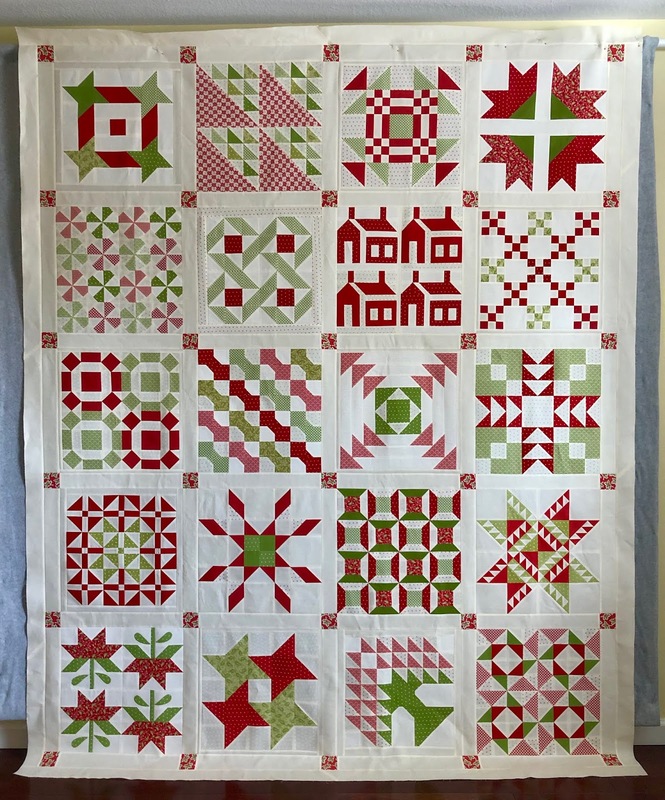 I started this project early December with hopes of finishing up before the end of the year, but when January rolled round and I still had Christmas decorations to pack up plus this quilt to finish I was tempted to put it in a project box, I had had enough of Christmas. Instead I stuck with it, finished it up and am now so happy that I did. I'm not one to have UFO's hanging around and I didn't want to start the new year with two. Two? 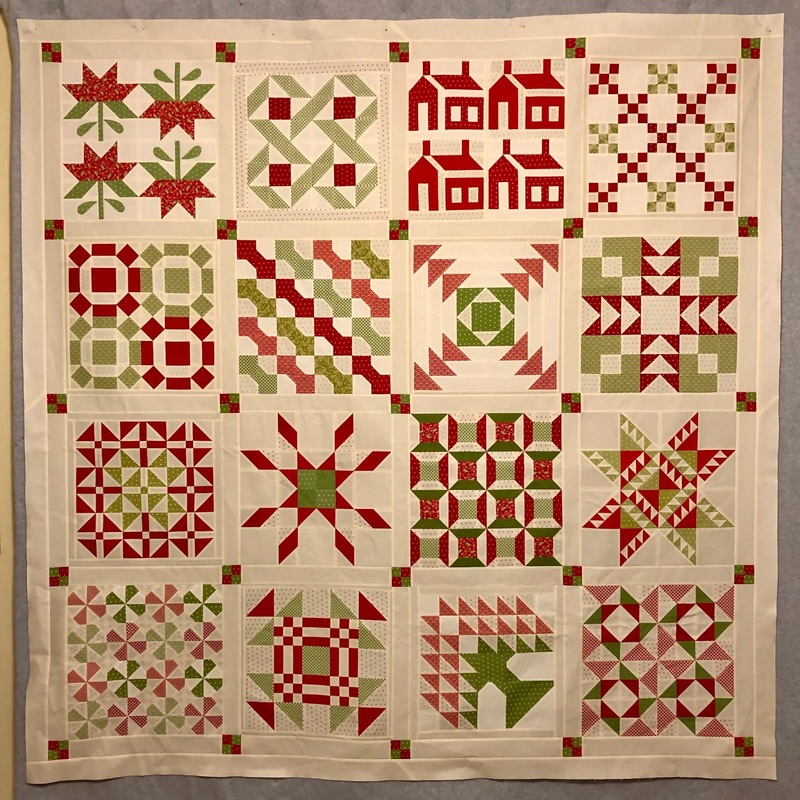 Yes, I thought this pattern would make a nice quilt for the Christmas festival that auctions one of my quilts each year. 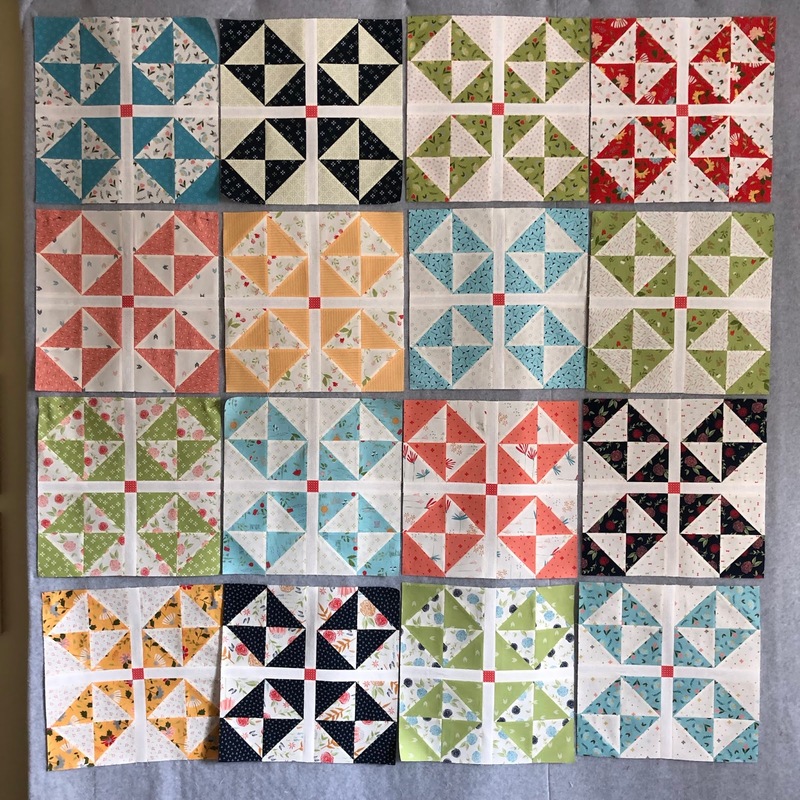 I loved the pattern and thought it would make a great quilt for the event but knew it would be a hard one to giveaway, so I made two of most of the blocks as I progressed through the book, one for me, one to donate. 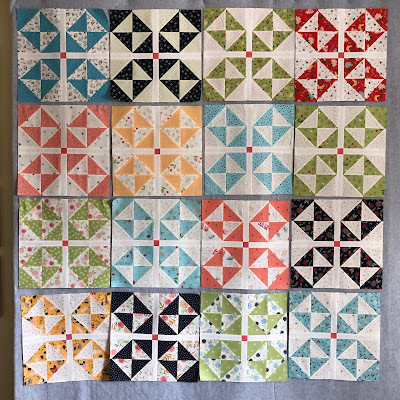 The pattern calls for 5 rows of 4 blocks, for a quilt that finishes at 79" x 97", that's a little big for my taste, so for my quilt I just went with 16 of my favorite blocks. This is Lifetime Quilt Number 241, the quilt I plan to donate to my local hospital and that has 20 blocks, like the pattern. It finished at 79" x 97" and has approximately 1,980 pieces. I swapped out a couple blocks and changed one but for the most part it's like the pattern. 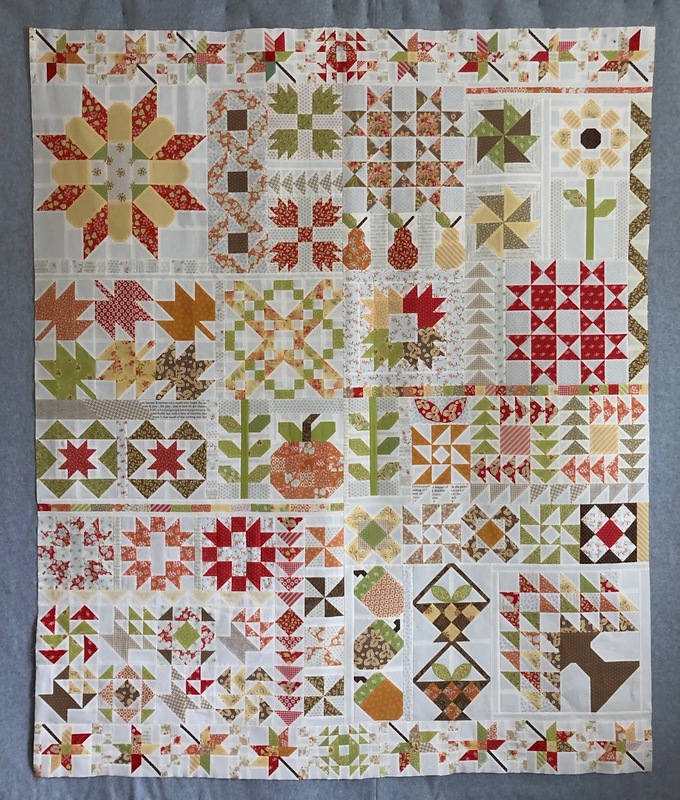 I'm so happy to have it done so I can get it quilted before my deadline this fall. Both quilts use the same background fabric, the difference in colors must be the filters I used on my phone. 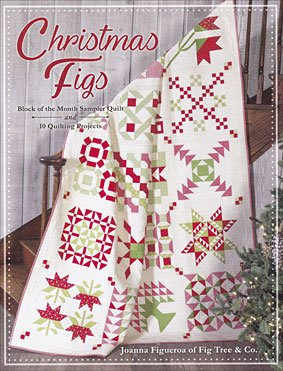 I think this book is great, if you didn't buy any of the Christmas Figs fabric this pattern would work for any fabric, I don't think it has to be Christmas themed fabric. 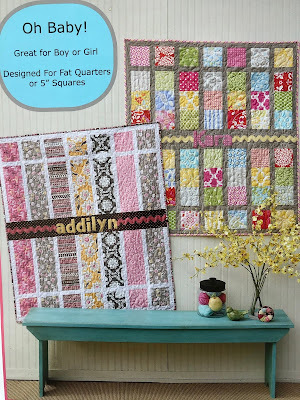 The book also has about a dozen small project patterns that are just as cute as the quilt. If you've not bought the book it's available here. Next up is to finish my Fig Tree Autumn Splendor BOM, I just received the last month in the mail. 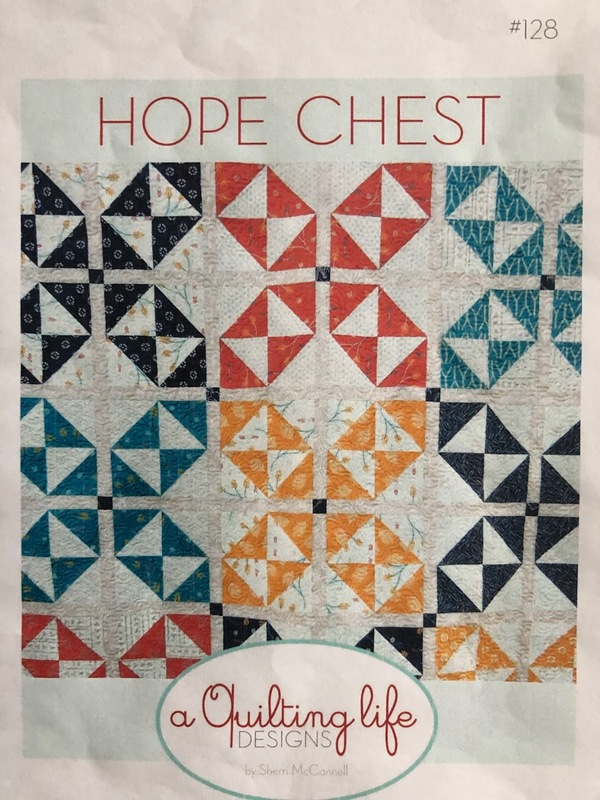 This top is the quilt I plan to donate to my hometown library for their annual raffle, which is in June, I need to hustle. But then my sewing obligations for 2019 will be met and it will feel great. More frequent blogging to come, I promise.